Are you in need of a new color copier that produces professional-quality color printing? 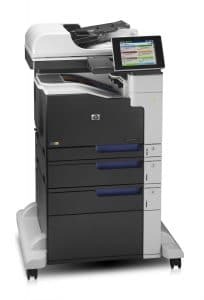 The HP Laserjet Enterprise 700 M775f Color copier is the newest addition to an already amazing HP copier range. With an amazing printing capacity of up to 30 pages per minute and a stunning printing resolution of 600 x 600 dpi you can count on this device to give quick but reliable results every time. With High yield toner cartridges available spend more time printing and less time maintaining! Impress with bold text and smooth color and get the color output you intended. Improve workflow using touchscreen controls to preview, edit, and digitally send documents at the device itself. Go from zero to done, right at the MFP. Print, copy, scan and fax from the large touchscreen. Need to print while not at your desk? No problem. This copier supports a wide range of printing from mobile devices including Apple AirPrint, Google Cloud and even Wireless Direct Printing. With this device you can benefit from reduced risk, maximized up-time and predictable service delivery. You can even manage access to color printing to help control operating costs. Saving money always sounds good doesn’t it?